With lots of MP3 music extractor software for Mac, it won't be an issue to rip MP3 audio from MPEG4 file, the problem would be the first to befall the output MP3 audio quality. Luckily, you don't need to be a tech guru to be able to losseless convert MPEG4 files to MP3 on Mac OS for free with the MP3 music ripper for Mac introduced here. Here we look at several simple ways to change MPEG4 to MP3 on Mac computers using video to MP3 converter, online program, and via VLC player. High quality, fast speed and ease of use, MacX Video Converter Free is the right one. With no adware, spyware, spam and ads, this clean program gives an opportunity to free convert MPEG4 to MP3 on Mac with output quality nearly as clear as the original one in 5X faster speed. You may be interested in other features, like adding subtitles watermarks to MPEG4 file, trimming, cropping videos, and many more. Thanks to nifty interface, it is very easy to learn to transcode MPEG4 video MP4 M4V to MP3 on MacBook Air/Pro/iMac Mac computers. Follow steps below to separate MP3 music from MPEG-4 video on Mac with zero quality loss. 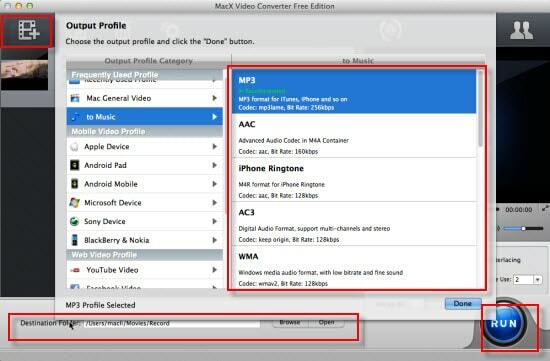 Step 1: Free download the video to MP3 converter for Mac and run it on your Mac computer. The program can be downloaded for the latest macOS Mojave. Click "Add File" icon to load the MPEG4 video file, an Output Profile window will pop up. Step 2: To change MPEG4 video to MP3 on Mac, go to "To Music" and select "MP3" as output format. Step 3: Click "Browse" button to choose a destination folder to save converted audio file on Mac. Step 4: Click "RUN" button to start MPEG4 to MP3 audio conversion on Mac. Wanna convert MPEG4 to M4A? MP3 vs M4A, is M4A better than MP3? The advanced version MacX Video Converter Pro not only converts MPEGP4 video to MP3, AAC, AC3, iPhone ringtone format on Mac, but also transcodes among SD/HD 4K UHD 8K video formats with preset profiles for the latest iPhone Xs/X/8/7/Plus, iPad Pro/Mini 4 etc, like YouTube to MP3, FLV to AVI, MOV to MP4, MTS to MOV, etc. On top of that, it works as a free YouTube video downloader for Mac with free lifetime update, allowing you to download videos movies clips music from 1000+ sites, including YouTube, Vevo, Vimeo, Facebook, Dailymotion, Metacafe, Xnxx, to name just a few. Among online programs, Zamzar stands out as a good choice. 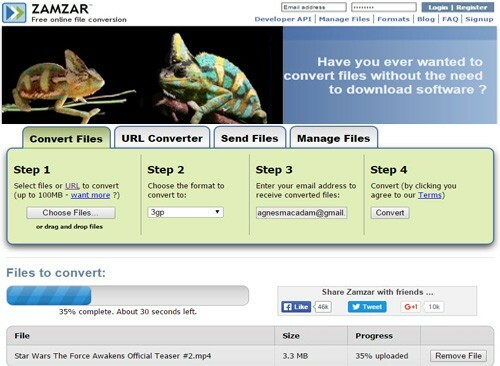 To convert MPEG4 to MP3 free online on Mac, open the site, http://www.zamzar.com/, head to "MP4 to MP3" (MPEG4 vs MP4, MPEGP 4 is MP4?). Step 1: Select MPEG 4 file from your computer by clicking "Choose Files" button. Step 2: Select a format to convert to. To change MPEG4 video to MP3 audio on Mac, choose "MP3" as output audio format. Step 3: Input email address to receive ripped MP3 audio file. Step 4: Click "Convert" button to start converting MPEG4 MP4 video to MP3 sound on Mac. Read the Terms carefully before you use the online program. The annoyance: it is great to rip MP3 music from MPEG-4 video on Mac for free online without the need to install any software on your computer, but not every one is willing to resort to online application. Zamzar, for example, asks users to enter email address, personal info is leaked. What's more, the maximum MPEG4 file size is 100MB, if you want more, you have to become a membership and pay for it. You have to wait for 24 hours or longer for the returned MPEG4 to MP3 converted files for Mac. If you are in urgent need of the file, converting large MPEG4 video to MP3 online may be a stupid choice. Fortunately, Zamzar alternative is easy to be found. Step 1: Open up VLC if you already have installed the media player on Mac, head to Media > Convert/Save. Step 2: Click "Add" button and select the MPEG4 media file you want to convert. 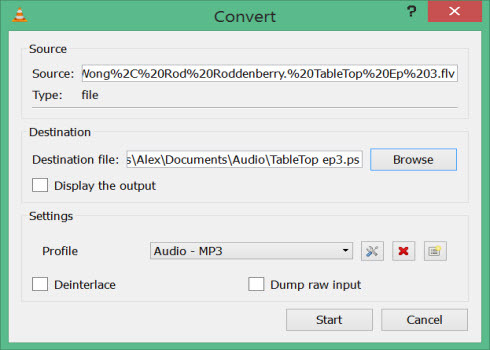 Step 3: After the Convert window pops up, browse for a destination for the MP3 audio file. Label the MPEG4 file .mp3 and press Save button. Step 4: Click on the Edit button, under the Audio Codec, choose MP3, you are allowed to adjust MP3 audio Bitrate, Sample rate as well, and click Save button. Step 5: Click "Start" button to start changing MPEG4 MP4 media file to MP3 on Mac. The annoyance: After all, VLC is a media player not a professional MPEG4 to MP3 converter for Mac. It fails to accept a wide range of media formats. Occasionally, sound quality may be terrible, this method is not recommended for users who are caring about the output audio quality and MPEG4 to MP3 conversion speed on Mac.